Kate Marr is an professional oil painter from Bournemouth and is an artist in residence at the Christchurch Emporium, Dorset, UK. 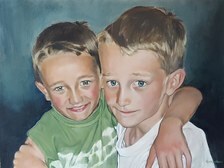 Here you can purchase original oil paintings and merchandise, discuss commissions and see Kate paint. Kate’s style is a fusion of modern impressionism and realism with a lively use of brush marks. She is known for her colourful and atmospheric paintings of various subjects, which include people and pet portraits, flowers, landscapes and seascapes. Kate works on archival acid free deep edge cotton canvas ready to hang with edges painted or canvas board which can be framed. She uses special handmade oil paints which contain natural pigments and no dryers. They are a similar quality of paint to that which the old masters used and are rich and vibrant. She can create a variety of compositions and work to different sizes. Please contact Kate and let her know your commission idea. You will decide on composition, size, price, timescale and arrange some sittings or look at your photos etc. She will then create a mock up for you, and once confirmed and a 50% deposit paid, Kate will start your commission. 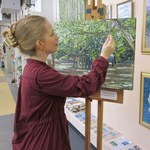 She works from photos and sittings in her studio in Bournemouth, or her shop in the Christchurch Emporium. Kate will keep you updated, and at the end you can let Kate know if changes are needed prior to final payment and collection or postage. After one year, paintings can be varnished. Kate offers framing, prints and a UK / International postage service.